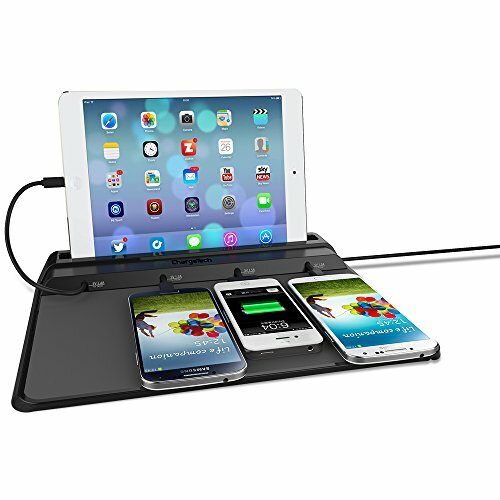 ULTIMATE CHARGING STATION - Charge 4 devices simultaneously without sacrificing charging speeds. Our most popular charging station for the home, personal office, and other low-traffic areas. The chargers stylish design looks great on tables, counters and other visible surfaces. Charge your entire home's devices in one place. CUSTOMIZABLE OPTIONS - Default layout of cables can be easily replaced or upgraded. Custom branding / wrapping available by contacting us directly! Anti-Theft Lock Kit and Wireless Charging Adapter available on Amazon! Click "from ChargeTech" to see all of our products! Build a charging solution that fits your life. Module design allows you to fully customize this product. UNIVERSAL COMPATIBILITY - Featuring FOUR high-speed universal cables: (2) Micro USB, (1) Apple 8-pin, (1) Apple 30-Pin. Includes a durable slot for tablets and other devices. Cables are compatible with nearly all devices. The station quickly charges Apple, Android, Kindle and countless other brands. Mobile Devices, Tablets, Laptops and much more can be charged uses this station. SATISFACTION GUARANTEED - Your satisfaction is 100% guaranteed. We offer a 30-day money-back guarantee and a 12-month warranty on all products. Phone, email, and live chat available on our website! Our friendly customer service quickly answers and resolves any questions and problems that you have. INTELLIGENT FAST CHARGING - Charging cables and USB ports are equipped with FastCharge technology to deliver the highest amps to your devices for rapid charging. No longer wait for devices to charge. Lightning fast charging speed means you can take your devices on the go quicker and avoid waiting around while devices charge. The charging station rapidly charges large and small capacity batteries.